Tianli is TenRen's most unique and highest quality Oolong. 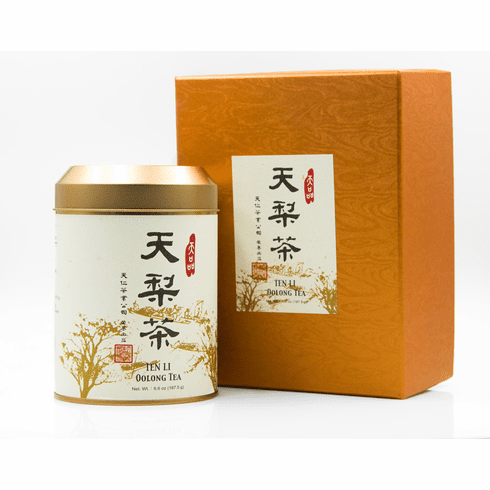 Grown in the Li Mountains of Taiwan, this tea is harvested at the highest elevation of 1200 meters in an isolated area. Due to the cold weather and relatively harsh environment, the plants grow at a very slow rate and in small quantities. The tea is either harvested during the winter or summer and sometimes only once during the entire year. After the harvest, the leaves are carefully handled and aerated during the long ride to the nearest tea master. Despite the difficult growing conditions, the leaves are selected as the highest quality of Oolong. This casnister comes in a satin lined green gift box. The steeped tea has a pale yellow-green color matching its faint fresh scent. Once tasted, the tea presents itself with a fresh taste followed by a sweet smooth aftertaste. Net tea weight is 6.9 oz (187.5g) and shipping weight is 1.44 lb.